IUEWT Escrima stands for a systematic which exceeds the practical application of martial arts by far. IUEWT Escrima (like IUEWT Wing Tsun as well – the counterpart from the China) is a holistic process, which teaches the practitioner how to permanently control the incoming attacking energy through a 100% prepared body structure via an intense physical and mental training. The attacked parts of the body „are being charged“ by the physical contact of the attack and render the energy back to the opponent in its entirety with only minimum action of our self. These three facts make it impossible for a visual orientated self-defense method to reach 100% security for one's own actions in regards to an incoming attack at full intent and intensity. The according logical counter measure strategy follows an ever consistent ‚leitmotif‘ – the principle of zoning (covering the zone)! IUEWT Escrima can trained aside without prior knowledge to any non-logical or traditional martial combat sports or martial arts, because of the teaching method ot the IUEWT is based on the independency of logic (of the body)! Hereby it is important that basic terms of logic and body strategy are to be distinguished against other non-logical or traditional martial arts or sports so that no false assumptions may arise. This is the main objective of a proper introduction into the IUEWT-Escrima. For already experienced practitioners of various combative disciplines IUEWT Escrima offers enough aspects and concrete enhancements for the efficiency improvements of the respective combat style or competition preparation – logic is not bound to any rules, and is thus universally applicable – platform independent! However, logic is broken by every artificially human made system of rules. In how far the practitioner up to which level is willing to apply the logic remains his sole choice. The logical base of all actions in IUEWT Escrima: the logical relation of risk and security. With it the only reasonable relation in terms of logic is that of 0 % risk and 100 % of security! If this thinking is broken down into all aspects, the concept of the ‚redundancy‘ or multiple security is coming into perspective naturally. The always recurring fact, that it is often not possible to leave a situation, or that a violant person has already ignored all set up boundaries being built up by techniques of de-escalation, must make aware, that a training for violence prevention should not only be based on techniques of verbal de-escalation – a training ratio should balance 80 percent physical to 20 percent mental. The logical fact is, that the body conducts uncontrollable and unchangeable reflex actions, once we arrive in a stage of panic. Hence it needs a much greater effort to bring the body towards a controlled behavior into compliance with verbal de-escalation in order to reach multi-level security. Training in verbal and behaviorial techniques for de-escalation are considerably more easy to learn on their own. Hereby to remember: every fight avoided is a fight won – given that the potential violent person makes this happen from his side too! IS IUEWT ESCRIMA SOMETHING NEW? Yes and no – IUEWT Escrima means innovation of the individual possibilities and abilities through constant work. Although coming from the past, it is more contemporary then ever, because logic does not know any ages! Escrima has, however, a history of approximately 500 years. 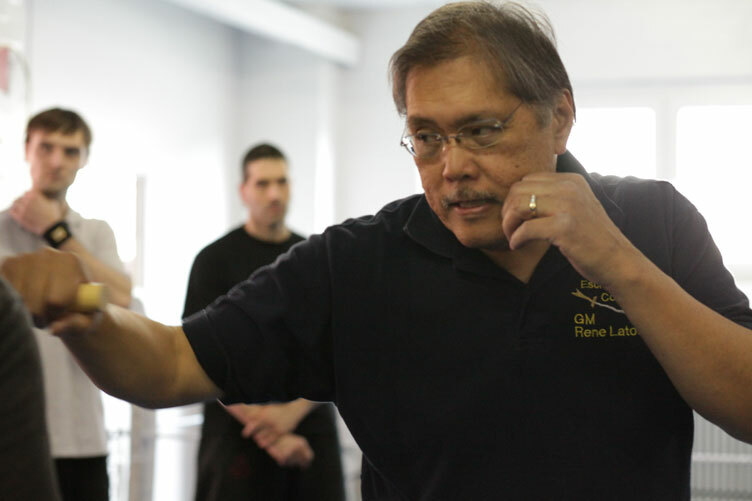 The IUEWT Escrima systematic is based on tenet developed by Grand Master René Latosa (USA), who already developed his traditional learning experience into a modern generic tenet. Through his extensive exploration in this field traditional tenets have become exlusively a teaching tool on a physical level, which without any strategic logical fucntionality is rather detrimental to one self. The strategic logical functionality of the filippino martial arts was solely developed and formulate by him. With it generalities are being embedded into a logical enclosed context, that are interconnetct to each each other. 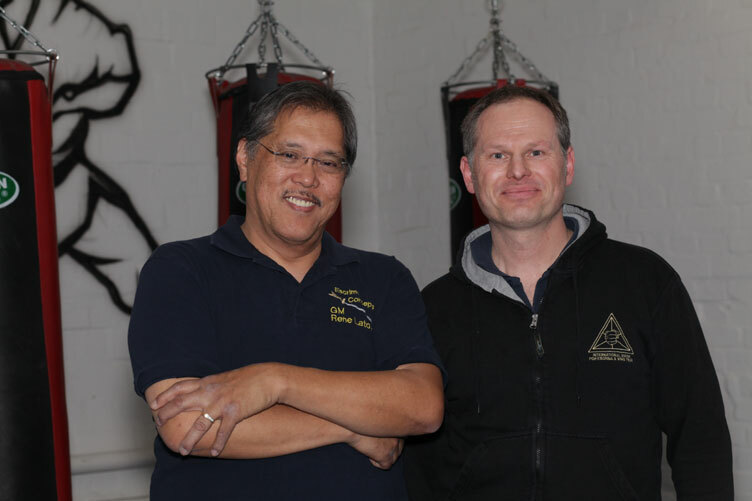 The elaboration of the conformance of this approach with the strategic logical functionality of the IUEWT Wing Tsun and the respective transition on the physical level is the unique and exclusive development of the IUEWT - the IUEWT Wing Tsun-Escrima. Our in over 40 years accumulated know-how from him is taught on highest international skill levels. Join us now for your journey into a new dimension real functionality!